Over the past few weeks, I’ve been working with Garry & Joel at IshFish with my foodie partner’s Chris & Charlotte to create a range of recipes. Ishfish is a new brand concept that will make cooking fish at home that little bit easier. As a chef, and one that’s based in Grimsby, the one ingredient besides game that I get asked how to cook on a regular basis, is fish. It’s such a simple, delicious and healthy ingredient to work with, and living next to Grimsby means we get it delivered fresh on a daily basis, yet so many of us are scared to cook it at home! IshFish have designed a range of boxes, packed with a variety of readily portioned fish for you to cook at home. Working with my partner Charlotte, we’ve created a range of easy-to-follow recipes, featuring all of the fish IshFish deliver to your door, making dinner a little bit more fun. 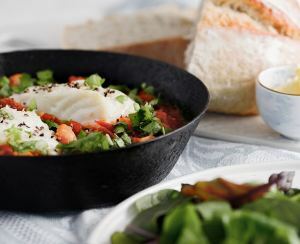 As well as sharing this warming fish strew recipe here on the blog, I’ll be whipping up this dish at The Lincolnshire Show during my cooking demo’s on both the Wednesday & Thursday. 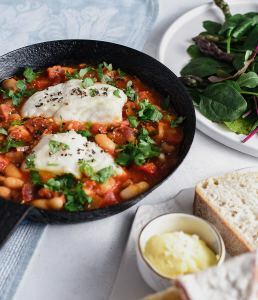 For any fellow Grimbarian’s, I shall be holding my head in shame that it’s not haddock, but this recipe is not to be messed with, the cod plays the perfect star of the show when teamed with the sweet and spicy beans and chorizo. Using a deep, heavy based frying pan, heat the oil and add the onion. Cook over a low-medium heat for 5 minutes until softened. Add chorizo and cook for a further 2 minutes, letting the oil coat the onions. Add the tinned tomatoes and fill the can with water, adding to the pan. Bring to the boil and season with cracked black pepper. Ones boiling, lightly season the cod fillets with salt and pepper and nestle into the pan. 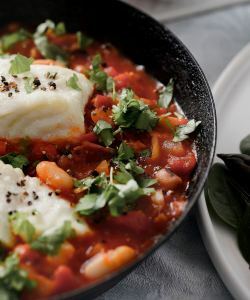 Reduce the heat and gently simmer for 7-9 minutes depending on how thick the fillets are. Add the beans and chickpeas and gently stir in. 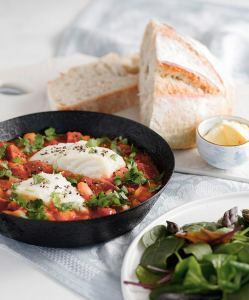 Scatter with parsley before serving with crusty bread and salad. Food Photography – Christopher Waud, GoPhoto!